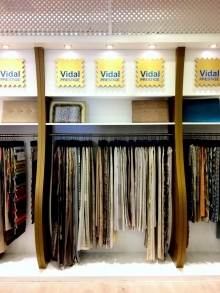 Vidal Prestige is a collection available in Lisboa of Opoto' showrooms of exclusive fabrics, selected according to the highest standards of quality and design, developed by the most remarkable international designers. You can find here about ten thousand references, allowing an wide offer of high quality fabrics constantly updated, able to satisfy the most demanding and delicate taste. The only problem for our clients will be the hard choice in the middle of such diversity and luxury.